The iPhone has benefited from unprecedented hype, generating more articles and buzz than any other recent gadget introduction. The iPhone has also been a critical success, getting rave reviews from tech sites and mainstream news outlets alike. Yet, analysts are disappointed by iPhone sales. AT&T recently reported 146,000 iPhone activiations in the second quarter. Analysts had expected there to be 500,000 to 700,000 activations in that time. News of the slower than expected iPhone sales has sent Apple’s stock down more than 6%. After receiving unprecedented hype and with solid technology, why isn’t the iPhone more of a hit? Fix the pricing – pricing was identified as a problem for the iPhone months before the device went on sale. After Apple’s iPhone announcement, one in four people wanted to buy one. However, only one in a hundred people said they’d pay $500 for it. As a result, Apple has a lot more iPhones than it’s selling. If you check iPhone availability at the Apple site, there aren’t any shortages. The $500 entry price is leaving lots of iPhones on the shelves, and keeping the iPhone platform from growing quickly. Fix Publishing From The iPhone – many people that buy a $500-600 phone want to not just consume media with the phone, but to create and publish media with it. While Apple’s managed to make listening to tunes, watching videos and surfing the Web easy and useful on the iPhone, it hasn’t made the iPhone a publishing platform. This seems like an opportunity squandered by Apple; they’re already leaders in the area of podcast and video podcast publishing, they’ve got a deal in place with YouTube, and they’ve got their own blog and podcast publishing technologies. Other vendors are turning their phones into mobile video blogging platforms and are passing Apple by. Fix Typing On The iPhone – Apple has made a big deal about demonstrating how easy it is to type on the iPhone’s virtual keyboard. With a phone this powerful, though, a phone that can do real email, view Word files and edit Web pages, lots of users will want to use it as a laptop replacement. While the phone makes the cut as a laptop replacement, the virtual keyboard doesn’t. If you’re a touch typist, being reduced to tapping out a handful of words a minute is painful. Apple needs to work with accessory suppliers to develop Bluetooth keyboards that work with the iPhone. People that want just want to respond to an email can do it with the virtual keyboard. People that want to use the iPhone as a read/write Web device need a decent portable keyboard. Fix The Phone – while the iPhone does a great job of meeting basic mobile phone requirements, it doesn’t have a lot of the calling features that other high-end phones have. Power users want to be able to search their contacts, do voice-dialing and have rules on how calls are handled. While advanced phone features aren’t for everybody, Apple’s made the iPhone a high-end niche product with its pricing. The people that spend $600 on a phone want power features. 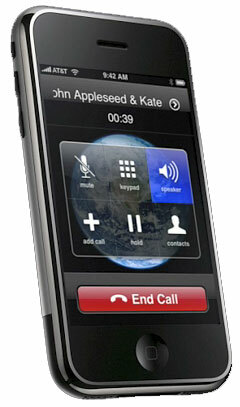 Fix Developing For The iPhone – Steve Job’s answer to developing applications for the iPhone is to let it run Web apps. This is nice, but Web apps aren’t the same as local apps – they’re slower, they depend on a network connection and they are limited in what they can do. The iPhone could easily be a platform for developers – there’s definitely interest – and more great apps would make the iPhone that much more desirable. Apple’s got good reasons to want to control app development for the iPhone – they don’t want to have the phone that takes out AT&T’s network. Apple needs to balance these concerns with what users and developers want and create a way to “sandbox” apps on the iPhone so that developers can create useful iPhone programs without risking the security of the network. So there are our five suggestions for fixing the iPhone. Let us know what you think in the comments! Update: Podcast pioneer Dave Winer has posted his reaction to Apple’s disappointing iPhone sales, too. He’s disappointed with the iPhone’s basic communication features, especially the way its email support compares to the Blackberry. He also echoes our concerns about typing and developing for the iPhone. I’m glad that Podcast News is such a multi-billion dollar marketing success that it feels it can give advice to Apple on their device. Some analysts pick random (unsubstantiable) numbers from their backside, publish it as a “report” and no-one does a logic check on their numbers. FWIW, it was impossible for there to be more than about 200,000 sold in the first two days. With activation problems going on at ATT’s contractor it’s likely the maximum possible sales (number of store, stock per store) were made. This story has zero to do with podcasting. Like way too many posts lately have no relevance to podcasting. Keep on topic or lose this subscriber.